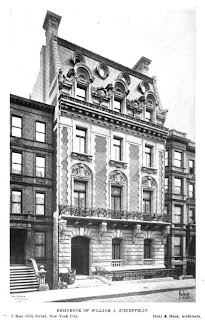 The William Jay Schieffelin residence designed by Richard Howland Hunt of Hunt & Hunt c. 1900 at 5 East 66th Street in New York City. Schieffelin was married to Maria Louise Vanderbilt Shepard and the residence was built by Maria's mother Margaret. Since the 1940s the house has operated as the Lotos Club. Click HERE for more on the Scheffelin residence. Click HERE to see the house on google street view. 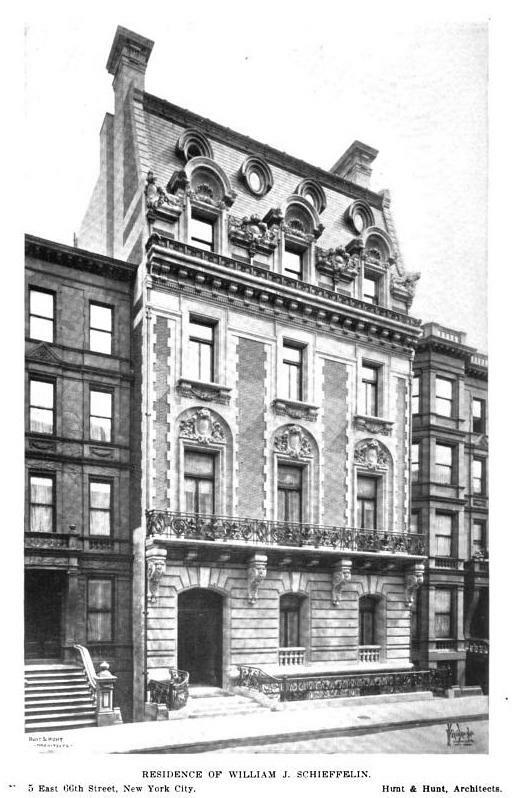 Photo from Architectural Record, 1902. I bear this home in my heart for 25 years ago, I was wed within its Bijoux rooms...greeting guests atop the masterpiece floating staircase under a skylight in jeweled tones, the newel post of bronze alone whisks one away to another age. The Ballroom, Library...inspirational for a such a day in ones' life, especially the Wedgewood room which was given over for private use. The evening capped with a private horse drawn carriage waiting at the door for a spin thru Central Park to end the day at the Sherry-Netherland for sleep! I attended a bris there, braced against the wall during the ceremony, just in case, reminded of why I was an architect and not a surgeon. I wonder how astonished Mrs. Schieffelin, who entertained braces of Bishops at a time, would be to discover that a bris was being held in her drawing room? The Schieffelins gave up their enormous cottage on Uncle George (Biltmore) Vanderbilt's summer estate at Bar Harbor(it was later purchased by the former Mrs. Clarence Mackay after the divorce and leaving Harbor Hill). They moved across the bay from the glitter of Bar Harbor to unfashionable Gouldsboro, where they created an estate on a large private peninsula, which they still occupy 100+ years later. PS to the Swan and Devoted: Two more different parties can't be imagined. I'll take the wedding. It sounds like heaven. go to the Lotos Club website. OMG the colors and gracefulness. I got a peek inside through the open wooden doors. It was marvelous. My dad was a member of the Lotos Club when I was a child and my parents would attend some seriously star studded events there..if those walls could talk.